Being a doula and writing a birth blog means that at some point or another, I will probably have to bear witness to everything that comes with pregnancy and birth. And as much as I wish otherwise, it's not always sunshine and rainbows. Two weeks ago I met with a potential client. She was about 13 weeks along with her fourth (and very unexpected) child. We got along great and I was hoping she would hire me as her doula. She had meetings planned with a couple of other doulas, but she said she'd let me know at the end of the next week what her decision was. That week came and went without any word. Then yesterday I received a text. She said that she wanted to contact me because she wanted my doula services, but things hadn't felt quite right for the last couple weeks. She was right. There was no heartbeat at her ultrasound appointment. She would be induced the next day (which is today). She thanked me for meeting with her and wished me luck. I was awestruck. I didn't know what to do. I was at work at the coffee shop, so I went to the washroom to process what I had just learned, and have a few tears. Even though the statistics say that roughly 1 in 4 pregnancies will end in miscarriage, it's not any less hard for the women who have to experience them. It's normal to feel sad, and angry, and alone, and like your whole world is crashing down. It's also normal to just feel numb. I cannot speak extensively about this subject as I myself, thankfully, have not had a miscarriage. And I firmly believe that you cannot judge anything, or make any statements about something that you have not experienced for yourself. I have experienced loss. And while losing my father is a much different loss than losing a child, the pain is still there. So what I will say, is that there is nothing I can say. Nothing makes the pain hurt less. To my almost client and anyone else who has suffered a miscarriage, I know that no one's words can make it better. Nothing can bring back what you lost. It is unfair and it is cruel. But, things will get better. It may take some time, it may even take years, but eventually you will start to feel better. Maybe not perfect, because nothing will ever be the same as it was before, but it will hurt less and less as time goes on. Having loved ones near you, and people to talk to in case you do feel like talking, can help tremendously. 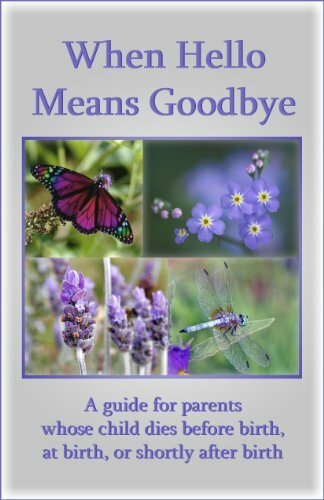 There's also a highly acclaimed book called "When Hello Means Goodbye", which is a great resource for dealing with the loss of a child. And I sincerely hope that none of you will ever have to read it. Sending love to all of the parents who have ever lost a child. You're not alone.